Don't let the spa-like music or the simple aesthetic of its game board fool you: Entanglement is downright maddening--and I mean that in the best possible way. This free online game, in which you rotate tiles on a game board in order to create the longest, most tangled path possible, seems very simple at first glance. But give it a try and you'll see just how challenging it can be. This tangled path may look long, but it resulted in a score of just 96 points, far below the 2,000+ points that some Entanglement players can score. Entanglement is available in the Chrome Web Store; the Chrome version of the game allows offline play. You also can play Entanglement using Internet Explorer, Firefox, Safari, and Chrome at vendor Gopherwood Studios (makers of Sand Trap) while connected to the internet. Single- and multi-player (up to 6) modes are available, but when playing a multi-player game, all of the players must use the same computer. Networked game play is not supported. 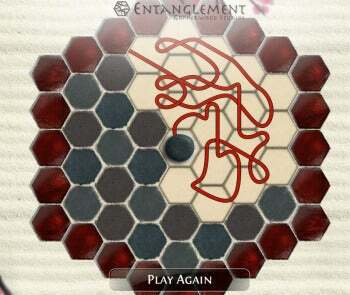 Your goal is to create a long, twisted path, using the tiles of Entanglement's geometric game board. The board itself is shaped like a hexagon, and features 36 playing tiles. (That doesn't include the starting center tile or the wall of tiles around the edge of the board.) Your path begins from the center of the board; you weave and maneuver your way around--attempting to avoid any walls and lines created by other players--by rotating and swapping tiles. You line up a game piece, and then click to see where your scarlet-hued line ends up. I was impressed with the 65 points I scored on my first game...until I took a look at the high scores and discovered that there are folks with tallies upwards of 2000 points. I am still dumbfounded that anyone can create a path that long, but I am determined to give it a try myself. And so I have bid adieu to Angry Birds and sayonara to Solitaire. For now, I am following the path of Entanglement. Here's hoping it leads me to enlightenment and not to the loony bin. Entanglement's premise--create the longest line possible--sure sounds simple, but this addictive game turns it into quite a challenge.